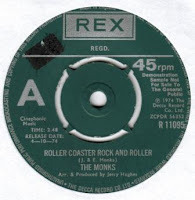 Roller Coaster Rock And Roller is a nice rockin’ update of Sweet Little Rock ‘N’ Roller but it somehow comes across like a Woolworth imitation of Dave Edmunds with the monkey-beat chugging guitars and treated slide. The vocal delivery gives it a slight teen angle, but the lead break is rather piercing …so I’m unsure of the demographics this single was aimed at. It would be nice to be able clear up this mystery…anyone? 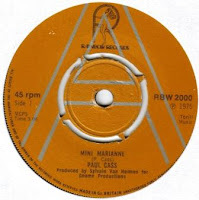 Mini Marianne is a vibrant high-velocity Glam Cruncher. The production is full and tight, it has an incongruous Synth part and fun lyrics including a choice line about making Coca Cola jellies…The B side is also an uptempo rocker, but not really in the same league. So who is Paul Cass? It’s probably a Belgian creation as it’s produced by Sylvain Van Holmen (sometimes spelt as Van Holme) who was in The Wallace Collection and Two Man Sound, but beyond that who knows? Holland has been a very fertile breeding ground for Junkshop Glam with killer releases by Pantherman, Dump, Black Fire, Left Side, Heavy Dwarfs, Zingara, Cardinal Point etc…(and dear Bonnie St. Claire). 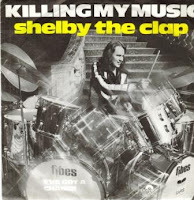 This Shelby The Clap single was one of the very few remaining Dutch Glam obscurities to be unearthed, which leaves me with two more to find (as far as I know). Shelby is in fact Shel Shellekens who drummed with The Incrowd, Brainbox and Rainbow Train. He later produced the Golden Earring album Cut in ’82 which featured the US hit Twilight Zone. 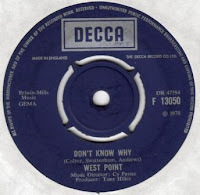 With near identical drum intros, both West Point songs are fine commercial Bubblegum/Soul concoctions similar to The Equals or Paintbox with Take What You Want being my favourite of the two. 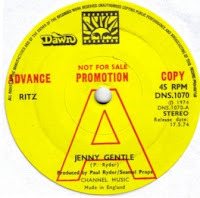 I'm unsure who the band actually was, but Don’t Know Why has a Swettenham credit, which most likely relates to Peter Swettenham from Grapefruit as I also have another single by Fluff ( Dance Dance Dance/ Don’t Say You Don’t – Decca F 13273) from 1971 produced by him. I’ve had this single for a while and when I took it out for a spin recently, I realised that I had never listened to the B side! And boy did I miss out as Why Love is a cracking Glam cruncher with a definite Sweet influence featuring guitar riffage in the same mould as The Easybeats’ Sorry. Jenny Gentle is more subdued, but is a prime catchy-as-hell commercial Pop song, with some tasty dual lead guitars. Both songs are written by P. Ryder and I assume that this is Paul Ryder who also served time as Paul Ryder And The Time Machine (Penny Farthing). In order to make further amends, Why Love is featured as the first edit of the two songs. 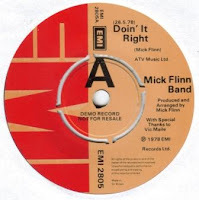 Incredible to think that this is the same Mick Flinn who was in The Mixtures (The Pushbike Song) and even more weird when you consider that he was also in The New Seekers! Both tracks are Killer Punk/Glam numbers with a great high -energy performance and tight production (it looks like Vic Maile was involved here). It seems that they were only demo copies of this single pressed, if you know otherwise -please let me know! The UK issue has a version of Reet Petite as the B side, this release has Schoolgirl which is a so-so Russ Ballard song. Billy Hamon also released an album on Acrobat called Bombed Singles, would that complete the set? I met these guys at the time outside the CBS building in Soho Square just as they were signing to Epic. They had pressed up this single privately in order to create a buzz and it worked as both tracks were later released on the faux-independent Blue Inc. and also on Epic proper. It looks like they were uncertain as to which song was to be the A side when they pressed it up, but in my book, there was no contest as Something About you is a powerful Punk/ Power Pop number of the highest caliber. To me it sounds like The Members infused with a top Pop tune and featuring a great rockin’ piano part such as Nicky Hopkins would lay down on those early Kinks sides. 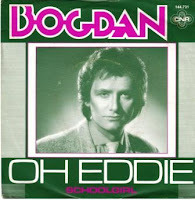 As a dubious marketing exercise, I will also be listing this single on ebay http://search.ebay.co.uk/_W0QQsassZpurepop1uk this evening. It's the last single I will be listing until January -Thanks!